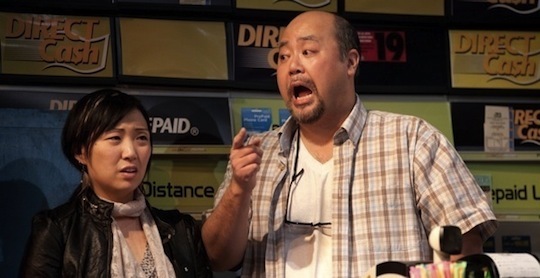 Soulpepper’s 12-play 2012 season officially began last week with the January 19th opening of Kim’s Convenience. The heartfelt, hilarious and supremely Torontonian play is an essentially unchanged remount of the same production from last summer’s Toronto Fringe Festival. The set is a little bigger- now a fully-dressed convenience store on the Michael Young Stage, oddly bigger than many of its real-life counterparts- and the addition of Lorenzo Savoini’s subtle lighting design is a welcome addition with it’s time-of-day indicators, but other than the inclusion of Cle Bennett (taking over the multiple non-Kim roles originated by Andre Sills), the play itself remains untouched by the move to the big-budget professional company. Soulpepper is a natural place for Kim’s Convenience, even though they’ve never staged a “fully original Canadian play” before. Playwright Ins Choi (who also plays prodigal son Jung) was a member of the Soulpepper Academy and has graced the Young Centre stages many times. There’s not a lot to say about the current production aside from that it maintains it’s heartbreaking charm even if some of the laughs are lost on a mostly English-speaking audience (there’s a particular poop joke that killed at The Best of Fringe Uptown that simply went unnoticed this time around). Bennett does a fine job slipping into the now-expert cast; he’s less imposing as businessman Mr. Lee and less intelligible as Jamaican-accented shoplifter Mike than Sills was but he’s great as the show-opening Rich and a comedic improvement on Sills as Alex the policeman (the most important of his roles- his chemistry with Esther Jun’s Janet is spot on). Paul Sun-Hyung Lee leads the cast again with his stunningly human performance as the titular Mr. Kim (aka “Appa”, “father” in Korean). He’s hilarious (“I am cool, what you talking?”) and angering (his temper is out of control) and alarmingly familiar (whose father doesn’t torture them about their life plans and embarrass them in front of a potential date?). And whether he’s giving Janet the breakdown of what social, racial and physical stereotypes are the most likely to steal from the store, blaming the Japanese invasion of Korea on unsuspecting Honda owners, finally confessing how much he loves his daughter or sharing his legacy with his estranged son, Mr. Kim is a creation that Choi and Lee should be proud of for the rest of their lives. And clearly Torontonians agree, because the run is already sold out. An additional run is scheduled for May. Check the Soulpepper website for details on how to purchase tickets. Read our original review of Kim’s Convenience HERE.